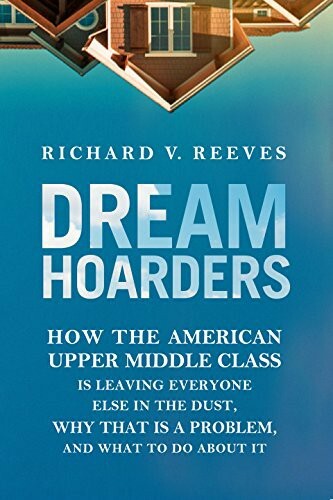 I recently read Dream Hoarders: How the American Upper Middle Class is Leaving Everyone Else in the Dust , Why that is a Problem, and What to do About It. Dream Hoarders is a book with a good point hidden in a really annoying lecture. The premise: Because of our society and our culture, the upper middle class is becoming a hereditary station in American life, not the meritocracy we imagine. The author’s flaw in logic: In order for poor kids to become rich, rich kids need to become poor. He seems to believe that people cannot become upper middle class unless people leave the upper middle class. He’s obsessed with the way he measures classes, by the top 20% of income earners or the top 10% of wealth holders. I believe instead that class could be measured by what you are able to do or what you have access to. I don’t believe only a certain percentage of people should be allowed to read or go to college. The annoying part: The author believes the book’s audience is the upper middle class (which seems reasonable) and he uses the first half of the book to lecture them about how they are keeping out poor people by ensuring their kids’ success. Better birth control. If people can plan families better, they will have kids when they can best plan and take care of them. Home visits. The early years make a huge difference in a person’s life and home visits can help make sure parents have the support they need. Better teachers. Our best teachers go to our best schools. We need a way to incentivize them — or make it worth their effort — to go to schools that serve more disadvantaged students. The author says a good teacher can make more of a difference than smaller class size or even more funding. Cheaper college. The author argues against free college and against plans like the 523 college plan which he says benefit the middle class. But he still argues we need more affordable colleges for everyone. He also argues that the bar is rising and you need a graduate degree to distinguish yourself. Zoning. In the US, schools receive tax money from the neighborhoods they serve. This means that wealthier neighborhoods provide more funding for their schools. The author argues for more mixed neighborhoods so that poorer families have access to better schools as well as better networks. Legacy admissions. The author argues that legacy admissions — giving preference to alum’s kids in college entrance — is really hurting our meritocracy. The author was really upset about this one. I wondered if it had impacted him or if legacy admissions just really seemed ridiculous to him. Open internships. The author argued that internships should be treated like jobs and subject to laws like minimum wage. Otherwise, only those that can afford to live in New York City or San Francisco and work for free will be able to take advantage of them. I also really liked the author’s point that a meritocracy works when all kids come equally prepared to opportunities. It’s not enough to give all kids the same opportunities, we need to make sure they have the same preparation for those opportunities.